The Israeli occupation authorities (IOA) arrested the Palestinian academic Osaid Fatayer at al-Karama crossing upon his return to the West Bank from Jordan on Thursday. Fatayer’s family said that their son was supposed to return home on Thursday evening, but they were shocked by the news about his arrest. They added that Osaid, a resident of Nablus, has recently obtained a PhD in Islamic Economics from Yarmouk University in Jordan. The IOA repeatedly target the Palestinian citizens passing through al-Karama crossing, which links the West Bank with Jordan, with arbitrary arrests. 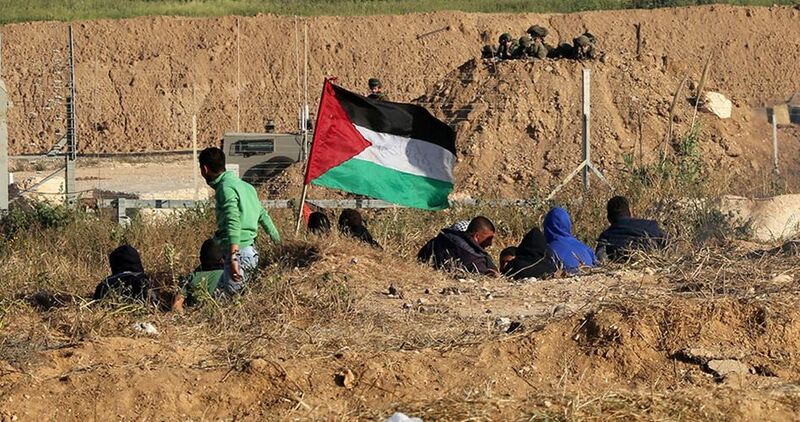 Three Palestinian journalists were injured east of Khan Younis on Friday as Israeli occupation forces attacked protesters in the ongoing Great March of Return at many encampments on the Gaza-Israel border. 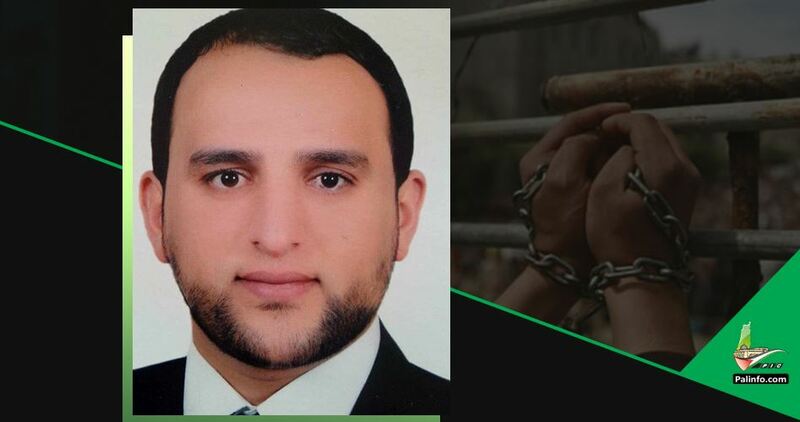 Journalist Abdul-Rahman al-Khatib intensely suffocated from teargas inhalation, and journalist Sulaiman Abu Zarifa was hit and injured by a teargas canister in his foot, while journalist Hamza Shami was hit by a canister in his shoulder, according to press sources. 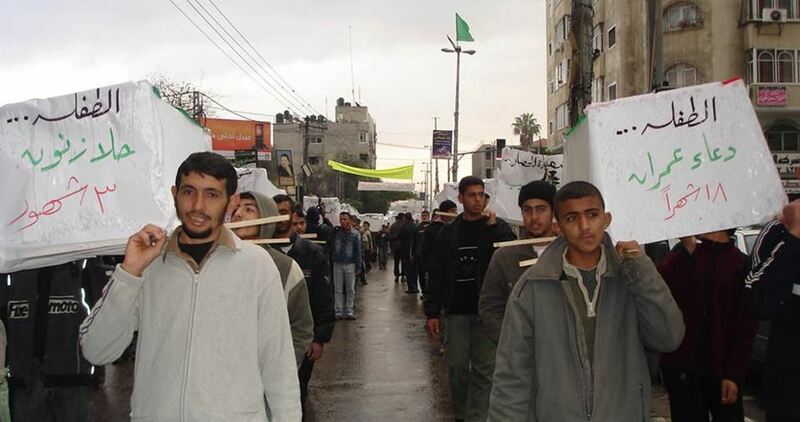 The 46-day Great March of Return protests started on March 30 and are set to reach their crescendo on May 15, which marks the 70th anniversary of the Nakba (catastrophe), in which over 750,000 Palestinians were forcibly displaced from their homes to make way for the creation of “Israel” in 1948. 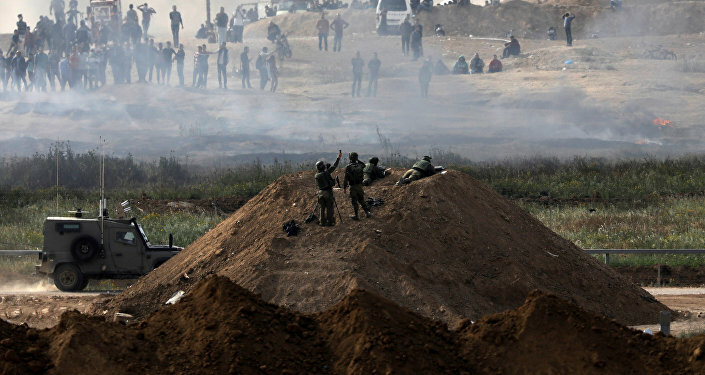 At least six Palestinians were injured on Saturday afternoon after being targeted by Israeli occupation forces (IOF) east of al-Maghazi refugee camp in Central Gaza. The PIC reporter said that IOF soldiers opened gunfire directly at the Palestinians and the ambulances leaving six citizens wounded including one paramedic and two children. 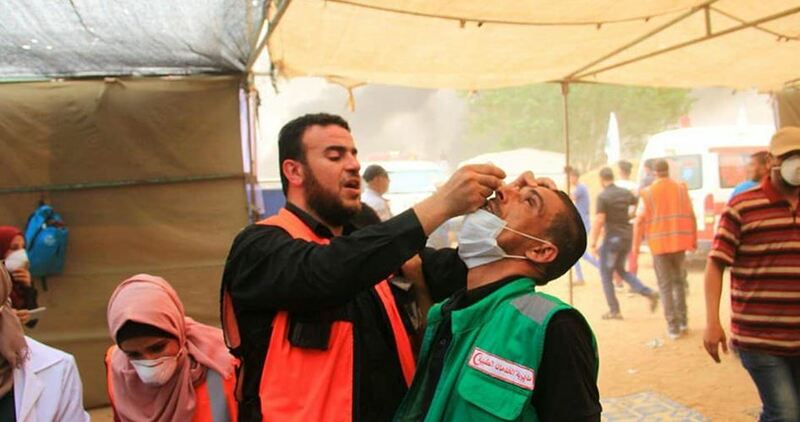 The Israeli occupation forces (IOF) on Friday heavily showered the medical tents erected near Gaza’s eastern border with teargas canisters injuring dozens of medics. 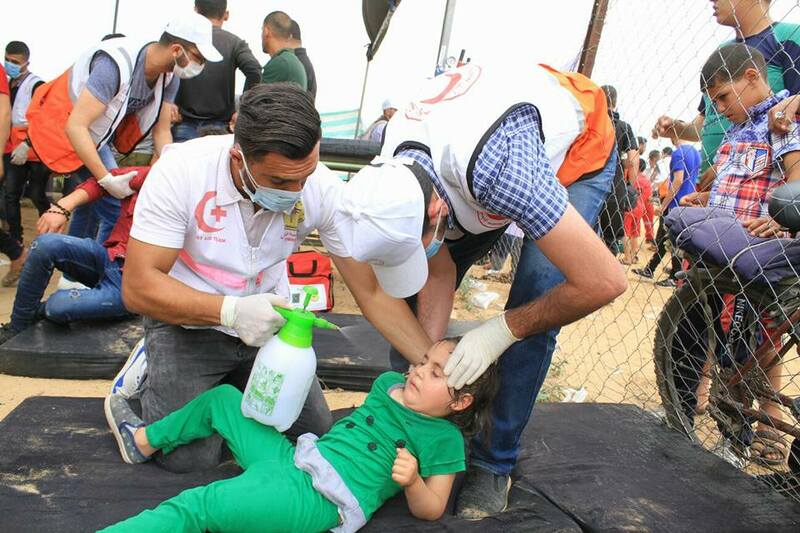 Spokesman for Gaza’s Ministry of Health Ashraf al-Qedra said that the IOF deliberately attacked medical tents east of Gaza, Khan Younis and Rafah cities causing dozens of suffocation cases among the medical staff. He added that the Ministry’s ambulances were another target of the IOF fire, noting that these attacks hindered the work of the medical staff during the protests. In a related context, the Ministry said that the IOF intensified their targeting of the children peacefully taking part in the protests. A Palestinian citizen, who suffered from a health problem, was proclaimed dead on Saturday morning in the besieged Gaza Strip after he was prevented by Israel from receiving medical treatment in hospitals in the occupied territories. According to the National Anti-Siege and Reconstruction Commission, the Israeli authorities had rejected several requests submitted by 41-year-old Mohamed Dababesh asking for allowing him to enter the 1948 occupied lands for treatment. More than two million Palestinians in Gaza have been under inhumane blockade for about 12 years. The siege claimed the lives of dozens of patients, who failed to receive medical treatment outside Gaza. When he was hit by a bullet fired by Israeli forces during demonstrations in Gaza on April 6, Mohammed al-Zaieem lost so much blood, and his left leg was so deformed, he feared he wouldn’t survive. His arteries, veins and a large piece of bone were destroyed. His right leg wasn’t spared either as the round created a massive exit wound and then hit it as well. By the time he was transferred to Istishari Arab Hospital in Ramallah after undergoing seven surgeries in Gaza, there was nothing doctors could do to save his left leg. It had to be amputated, unbeknown to al-Zaieem, 22, who was unconscious at the time. “No one dared to tell him [when he woke up from the surgery]. I couldn’t,” said his cousin of the same name, who lives in the occupied West Bank. Al-Zaieem is among the 24 Palestinians who have had their limbs amputated since the March of Great Return mass protests started on March 30. The bullets are the deadliest the Israeli army has ever used, according to al-Qedra. “Normally, a regular bullet breaks the leg [upon impact]. But these bullets create massive wounds, indicating that an explosion happened inside the body. It’s an expanding bullet. It pulverizes the leg, and the leg gets cut off [as a result],” al-Qedra explained. At least 45 Palestinians have been killed since the March of Great Return movement began a month ago – the vast majority by this new type of explosive bullet, health officials say. About 7,000 Palestinians have been wounded. Gaza’s medics have struggled to cope, not just with the sheer number of injured demonstrators that rush through the hospital doors every Friday, but also to properly treat these kinds of ghastly wounds. Medical staff from Doctors Without Borders (MSF) operating in Gaza say patients who have been shot with the rounds have sustained fist-sized wounds of an “unusual severity” and will have to undergo “complex surgical operations”. “Half of the more than 500 patients we have admitted in our clinics have injuries where the bullet has literally destroyed tissue after having pulverized the bone,” said Marie-Elisabeth Ingres, head of MSF in Palestine, in a report. Explosive rounds were banned internationally under the 1899 Hague Convention because of the “unnecessary injury and suffering caused from large bullet wounds”. Under international law, when the use of force is unavoidable, law enforcement officials must make all efforts to minimise injury. “We know about the kind of wounds that this bullet creates in the body and from the remnants of the bullets, the shrapnel that they take out. We know that this is something that we’ve never seen before,” al-Qedra said, adding that the rounds have been used since the March of Great Return movement began. 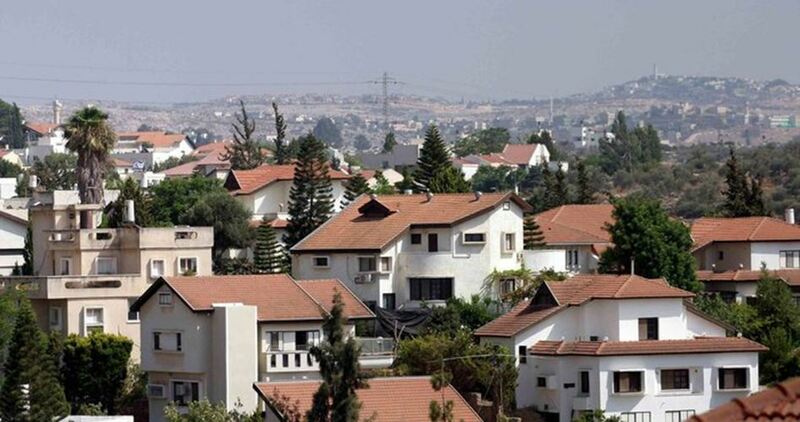 A spokesperson from the Israeli army rejected the allegations. “The IDF only employs means that are lawful under international law. 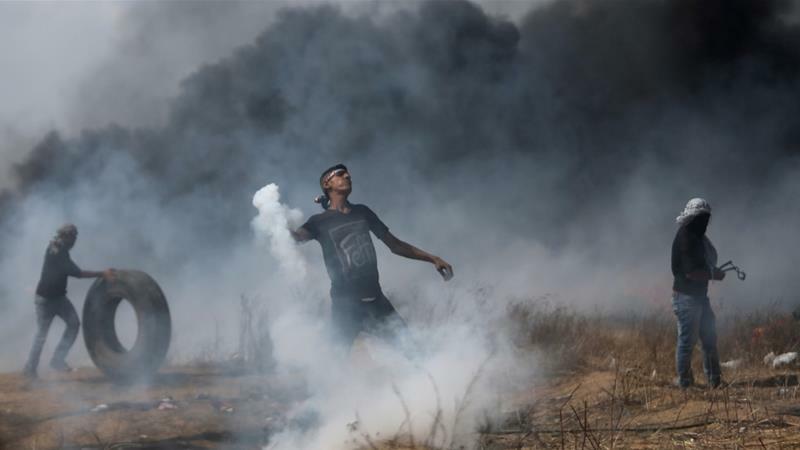 No new bullets or gas have been employed during the recent events in the Gaza Strip,” the spokesperson said in an email to Al Jazeera. Many have documented how Israel has “turned the occupied territories into a laboratory for refining, testing and showcasing its weapons systems”, which it later sells worldwide with the advertisement that the products have been “tested in combat”. Israel is smaller than New York, yet it’s believed to be the largest per capita weapons exporter in the world. The butterfly bullet, however, isn’t the only new weapon featured prominently in the protests in Gaza. 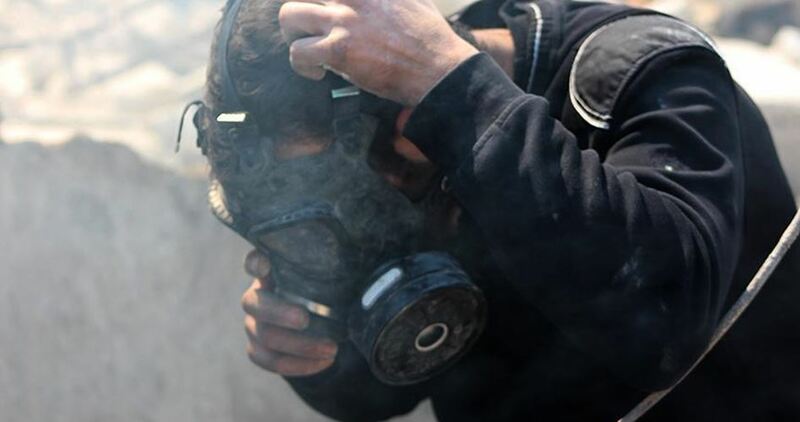 Palestinians have also noted an unknown toxic gas launched at demonstrators, which provokes severe convulsions. The yellow-green gas has caused many who were exposed to it to convulse, their legs and bodies thrashing violently as they lay on the ground. Others suffered from asphyxia or experienced extreme migraines and rapid heart rates. 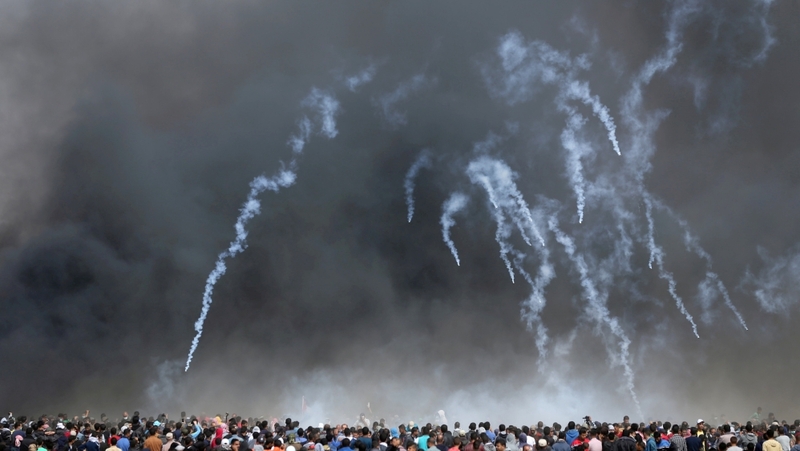 “It’s much more dangerous than tear gas, and its symptoms are more severe,” explained Dr Ashraf Joma’a, a chemistry specialist from Gaza, noting it is difficult to find an appropriate treatment. “One of the cases is Ahmed Zo’rob, 18, who has lost his consciousness since the first Friday of the march [March 30] and has been transferred to Egypt for treatment,” Joma’a said. “We have unexploded gas bombs as samples here, but the scientific potential in Gaza is too weak to properly detect the various advanced gases used by the Israeli occupation,” Joma’a said. Seventy-five people are currently being hospitalised because of exposure to the gas. 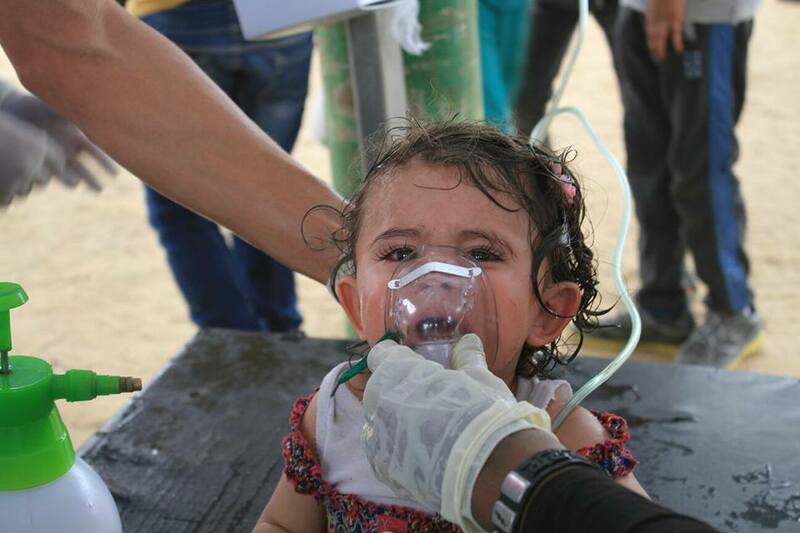 Last Friday, Gaza’s Ministry of Health reported that Israeli forces launched unidentified gas bombs at medical service centres, east of al-Bureij refugee camp in central Gaza, which resulted in severe vomiting, convulsions and asphyxia for dozens. In another first, the Israeli army also experimented with “crowd control” methods last March by using drones to drop tear gas on protesters. 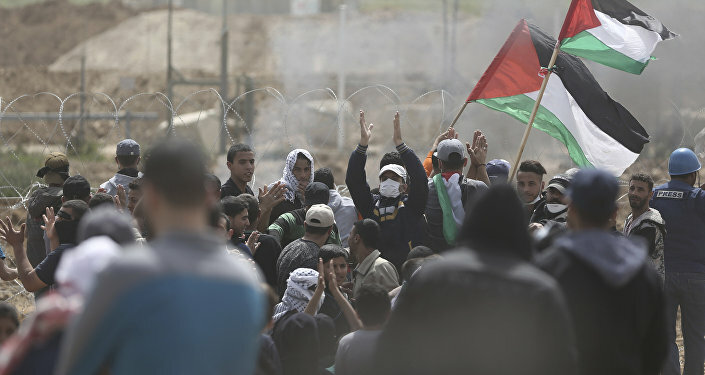 On Friday Amnesty International issued a report calling on governments worldwide to impose an arms embargo on Israel following the country’s “disproportionate response” to the demonstrations along the border fence. 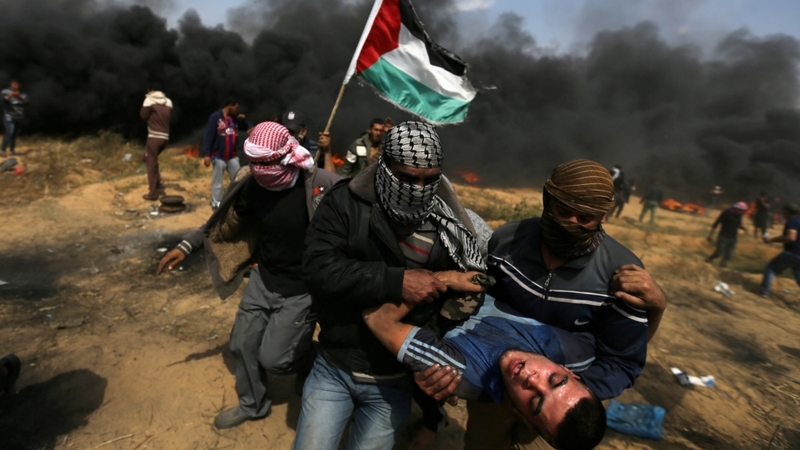 “The nature of these injuries shows that Israeli soldiers are using high-velocity military weapons designed to cause maximum harm to Palestinian protesters that do not pose imminent threat to them,” said Magdalena Mughrabi, Amnesty’s deputy regional director for the Middle East and North Africa. For Palestinians in Gaza, there are few options. The situation is dire but protesting for change comes at a huge risk. 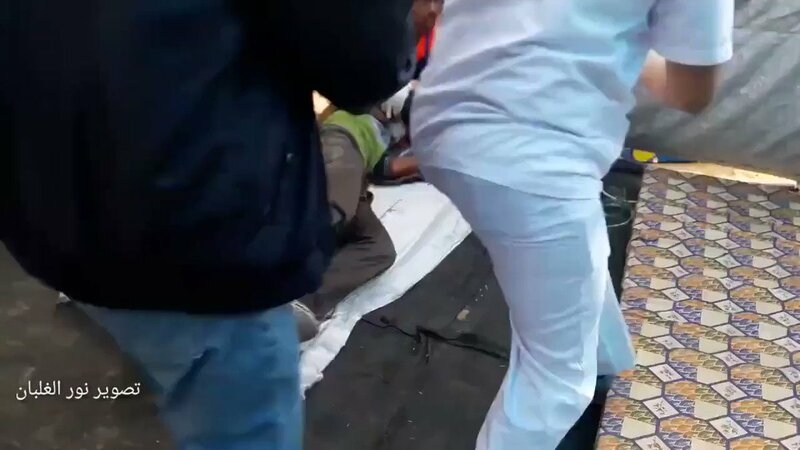 On that fateful afternoon on April 6, al-Zaieem had seen a wounded protester, bleeding from the leg, lying on the ground about 70 metres away from the fence and fully exposed to the line of fire. He ran over and quickly dragged the wounded young man to a safer area behind the nearest sand mound. The Israelis shot at them several times, but they were unscathed. Al-Zaieem waited about 10 minutes for the shooting to calm down – but the Israelis were waiting as well, his cousin recounted to Al Jazeera from the West Bank. The moment al-Zaieem stood up to run and call the paramedics, he felt the “electricity” run through his leg as an explosive bullet hit him. “Later he said, ‘It’s okay’ and that ‘It’s God’s will; praise be to God’. But he’s just pretending,” his cousin said sadly. Israeli soldiers abducted, Saturday, a young Palestinian woman, near the Al-Aqsa, in occupied Jerusalem. 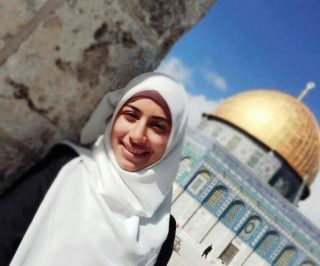 The soldiers stopped the young woman, identified as Aya Abu Naab, 19, from Bab Hotta neighborhood, adjacent to the Al-Aqsa Mosque, in the Old City, and abducted her. The young woman was cuffed before she was taken to a nearby interrogation facility. It is worth mentioning that Aya was detained by the army three times over the last several years, and received various orders preventing her from entering the holy site. She was placed on a “blacklist” preventing her from entering Al-Aqsa for life, for protesting ongoing invasions by soldiers and colonialist settlers, and their provocative tours, in the holy site. 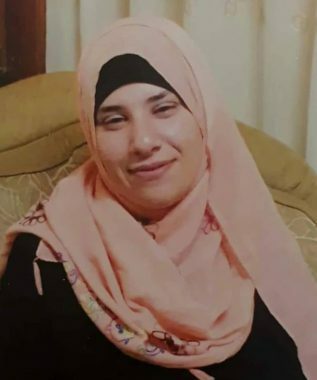 Following her first abduction in 2016, she was interrogated and beaten by the soldiers, and received an order preventing her from entering Al-Aqsa for 15 days. In related news, the soldiers invaded and searched many homes in Yatta town, south of the southern West Bank city of Hebron, causing property damage, and installed several roadblocks. The soldiers also installed roadblocks at the main roads leading to Sa’ir and Halhoul towns, and at Hebron’s southern entrance, before stopping and searching dozens of cars, and interrogated several Palestinians while inspecting their ID cards. GAZA (Sputnik) – Palestinian President Mahmoud Abbas has warned that Palestine will soon take “serious and dangerous steps” against Israel and the United States.